When Suede played the opening bars to the gorgeous By The Sea at Bexill-on-Sea's De La Warr Pavilion last night, Brett Anderson allowed himself a wry grin and told us, "we had to play this tonight". And perhaps not just because of the coastal setting, but because it is one of the best of those sumptuous Suede ballads that manage to be both uplifting and melancholy at the same time. With a repertoire of such quality, it must be a difficult task for the band to decide what to leave out of their set. Anderson asks us for our indulgence in the first part as they run through some less obvious song choices but all with that trademark loose and dirty guitar sound, as if Mick Ronson had been in a punk band. That sound was first heard on their clutch of early records, and it is from the B sides of those singles and their most recent album, 2013's Bloodsports, that the opening numbers are drawn. If not all of the crowd are familiar with Suede's earliest and latest material, this has no effect on the thrilling atmosphere. Anderson prowls the stage between the glam racket of Richard Oakes and Neil Codling's guitars and the rumble of silhouetted pair Mat Osman and Simon Gilbert's rhythm, whipping the air with the microphone lead and clearly having fun. The gear-change for the audience comes with Filmstar, from 1996's Coming Up, which is greeted with wild hysteria. 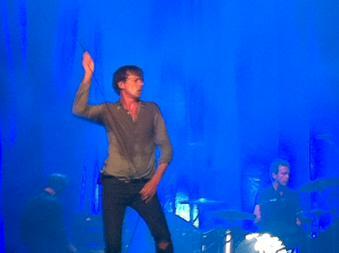 Suede's third album was made after Bernard Butler had left the band; producing five top ten singles, and with all the other tracks sounding like hits, it was the band's biggest album. They could have played it in its entirety and garnered a similar reaction to every song. As it is, we have to settle for three more. We also get those early singles - So Young, Metal Mickey and Animal Nitrate - which reminds me of the salvation the band brought. The early 1990s was a fairly arid time for new alternative music: the interregnum between the end of Madchester and the birth of Britpop was filled with the imported self-loathing of grunge, or even poorer domestic facsimiles. That music lacked grace, style and humour, and seemed to be only a hairsbreadth away from the male posturing of heavy metal. Then, enter Suede. Fronted by an androgynous council house back bedroom dreamer, and with a swift-wristed rock 'n' roll guitarist at his side, they dispelled the drabness of the Seattle sound with an injection of energy and urban poetry - "through the slippery city we ride/skyline swine on the circuit" - that paved the way for a British resurgence. Having played a lengthy set, Suede return to the stage for an encore composed of a triptych of songs from arguably their greatest album, Dog Man Star: the beautifully tender, The 2 of Us - "Watching my mistakes/I listened to the band" - is followed by the sexual hollowness of The Asphalt World; and then, finally, the symphonic crescendo of Still Life sends us away, "into the night".